As many young adults continue to disengage with learning each day, teachers and administrators struggle to find ways to re-engage secondary students with their schooling and communities. Re-engaging Disconnected Youth profiles a program that succeeds in doing so, one that can serve as a model for others. In a Midwestern alternative school, three teachers built a curriculum around hands-on learning, restorative justice Talking Circles, and multicultural education, in the hopes that it would re-engage and inspire youth. 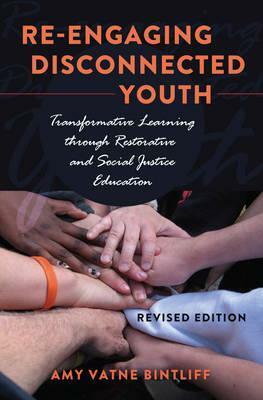 Drawing on Adult Transformative Learning Theory, the book is an in-depth, qualitative study of the ways the program transformed adult and youth perceptions of trust, connections, schooling and human rights. It breaks down stereotypes about youth labeled "at-risk" and provides evidence that it is never too late to become passionate about learning. This new revised edition includes updated research and a chapter exploring the impact of the program on middle school youth. Contents: Program Design and Implementation - A History of the Experiential Outdoor Education Program - Westward Bound Expedition Closing Circle, June 2006 - Heading West: Hands-on Learning and Outdoor Education Increases Student Motivation - Factors That Influenced Transformative Learning: Hands-on Spontaneous Education - Factors That Influenced Transformative Learning: Separation From "Normal" Life - Factors That Influenced Transformative Learning: Nature - Restoring Community: The Impact of Restorative Justice Circles on Student Feelings of Connectedness - School Connectedness - Restorative Justice Overview - Restorative Justice in Schools - The School-to-Prison Pipeline - The Origin of Peacemaking Circles - Philosophy of Circles - Components of a Talking Circle - Causes of School Disconnection - Circle Fosters Positive Student - Teacher Relationships - Circle Shifts Student Perceptions of Each Other - Shared Experience, Mutual Respect/Trust, and Relatedness - Connectedness - Additional Results of Circle Experience - Forgiveness and Circle - Healing and Circle - Multicultural Education, Human Rights Education, and Teaching for Social Justice: Transforming Ideas About History, Racial Identity, and Service - Content Integration - Knowledge Construction - Transformational Learning via Wounded Knee - Prejudice Reduction - Racism and Circle - Equity Pedagogy - Culturally Relevant Practices - Human Rights Education - Social Justice in Education - Promoting Justice for Students - The Impact of Westward Bound on Middle School Learners - Needs Assessment - Unique Needs of Middle School Youth - The Middle School Program - Middle School Results: Hands-on Learning - Middle School Results: The Impact of Talking Circles - Extending the Boundaries of Transformative Learning - Afterword: Teacher as Transformative Learner (2011). Amy Vatne Bintliff is a teacher and researcher who has taught language arts and reading in traditional and alternative programs in Minnesota and Wisconsin. She received the 2014 Teaching Tolerance Award for Excellence in Teaching from the Southern Poverty Law Center. Bintliff is a graduate student in Educational Psychology- Human Development at the University of Wisconsin-Madison.